If you know me, you know that I don’t like to waste time. I’m from Brooklyn, so I talk fast and I walk fast. I like efficiency and speed. This is very true in all facets of my life, including my work as a PPC marketer. That is why I love the Google AdWords Editor Tool. 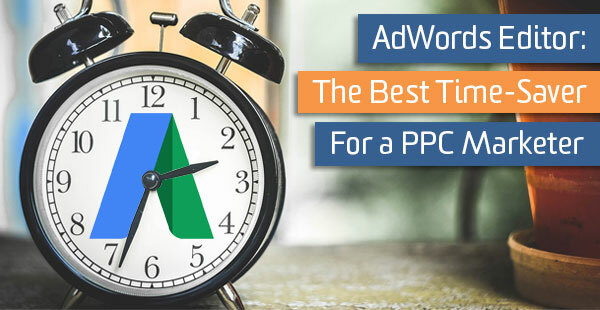 If you’re a PPC marketer building and managing campaigns, it is, hands down, the best tool to save you time and make your processes faster and more efficient. The Editor Tool – What Is It? The Google AdWords Editor tool is the offline version of AdWords. There, you can access account data and make quick, bulk edits. It’s all at your fingertips. Quickly click from one place to the next to get from keyword to location targeting to sitelink to placement targeting and so on. Below is a picture of the offline AdWords Editor Tool. The snapshots that you’ll see in this post are from a fake account. No real, client data is being shown! Here’s a quick overview of the tool in case you are unfamiliar. If you’ve used it before, scroll down to the next section! This is where you’ll find all of your campaigns. This is where you navigate to campaign elements and targeting criteria to make changes. It’s very easy to click from one place to the next. Need to access ad copy? Click on ‘Text Ads’ (or ‘Expanded Text Ads’ now). What about your keywords? Find the ‘Keywords’ selection. How about making an update to the call extensions? Click the ‘Call Extensions’ selection. Provides an in-depth view of your campaign elements or targeting criteria. This is where you make adjustments. 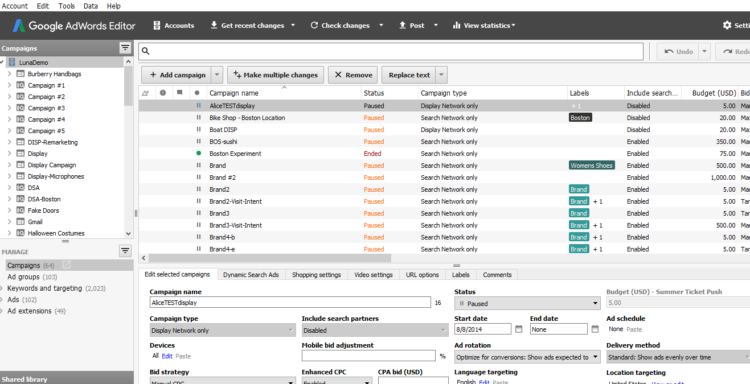 Adjust settings, targeting criteria, ad copy, keywords, bids, naming conventions, etc. You don’t have to wait for a webpage to load. You can click from one section to the next without worrying about load time. You can use copy (CTRL + C or CMD + C) and paste (CTRL + V or CMD + V) to easily copy and paste almost anything. Campaigns, ad groups, keywords, location targeting, audience targeting, negative keywords, ad copy, sitelinks, etc. Tip: This is helpful for everyone! Imagine that you never have to go through the process of creating a campaign from scratch again. You press CTRL + C, then CTRL + V and… you just created a new campaign in a few seconds! Granted, you’ll need to make adjustments, but you can easily copy, paste and then update. I do this ALL the time. Additional Tip: Don’t limit this to campaigns. Copy and paste ad groups, keywords and ad copy too! Location targeting becomes especially easy. In the offline tool, you are not able to copy and paste locations. In the online tool, you can. I bet I just saved some of you at least an hour of work with that last tip. You can select multiple items across campaigns and ad groups to make quick bulk edits. You can easily highlight multiple items account-wide. By doing this, you can make quick, bulk changes across your entire account. Tip: I use this a lot for ad copy. Let’s say I need to make a bulk change to ad copy found across multiple campaigns. I select all the copies using the control or shift button on my keyword and from there, make that ONE change across a TON of ad copies. This saves more time than updating each individually. Find and replace for keywords, ad copy, naming conventions, etc. Bid change functionality that lets you adjust bids by a certain percentage, raise to top-of-page bid or first-page bid. This is a little-known secret. Tip: I use the append or prepend functionality when turning non-brand keywords into brand keywords. For example, if you want to add brand variations, you can take your non-brand keywords and use control + h, then append your company’s brand name. Now you have a branded keyword. I do this across multiple keywords at the same time. The “Make Multiple Changes” button sounds exactly like it is. You can speed up the process of adding any campaign elements by loading them all at once. Need to add 20 new keywords? How about new ad copy? Even several new campaigns and ad groups can be loaded into the offline editor tool at once. Expanding keyword match types becomes simple. When adding new keywords, it is likely that you’ll want more than one match type. Using the copy and paste functionality, it’s easy to get all those different match types in your ad group within seconds. Here’s a scenario: You have 10 keywords in your account all in exact match. You also want them in phrase match. All you have to do is copy the current exact-match keywords (CTRL + C), paste them (CTRL + V) and then update the match type button from ‘Exact’ to ‘Phrase’ which literally takes 5 seconds. 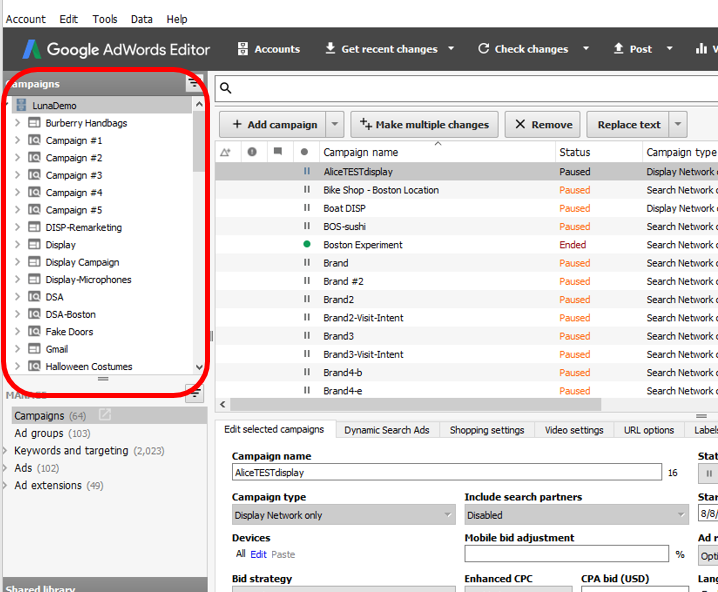 Go to the AdWords Editor Tool page. Once you download, make sure to get the most recent changes as noted above. Google will periodically release new versions so always make sure you have the most up-to-date one. The Google AdWords Editor Tool is a great time saver, but it’s also complex and takes some time to master. There are a ton of free YouTube videos to help you get started and continue to learn. My co-worker, Nick, wrote a great blog post on common issues and how to solve them. It’s a great resource as well! 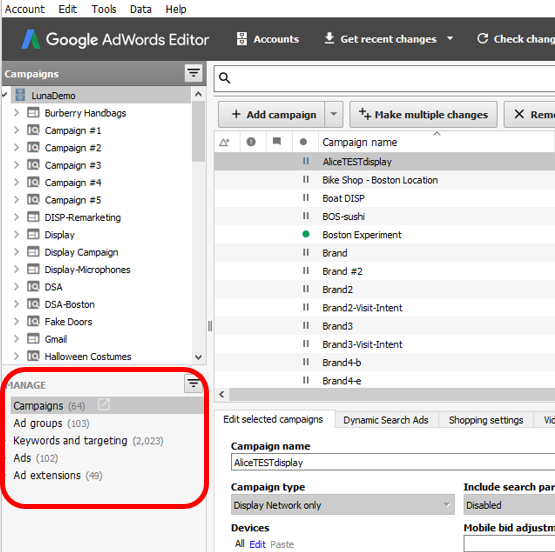 So get started, try out the AdWords Editor Offline Tool and let me know how much time you save!